genuinearticlex7.wordpress.com Author Chris Queen In 1948 Israel was reborn as a modern nation just as several of the prophets from Moses onward said would occur after the dispersion of Israel throughout the nations to the far ends of the earth. Ezekiel lay upon his side(s) as commanded by God, a day for a year, symbolizing 430 years of Israel’s and Judah’s remaining punishment with 70 years then already served per Jeremiah’s prophecy. Therefore with 360 years remaining per the original instructions from the Lord. But Ezekiel’s 360 years came and went without the return. The Lord had prophesied through Moses seven times the punishment for failing in sincere return to the Lord. The 360 years therefore became seven times 360 and Israel did not re-emerge, per God’s prophecy to Moses, until 2520 years had elapsed in 1948 as Moses through Ezekiel specifically and accurately predicted. Israel was reborn as a modern nation per recognition of the also prophesied United States and the United Nations on May 15, 1948, there in one day as predicted by Isaiah in Is. chapter 66. The Lord had told his prophet he would in later days not be known as the God who led Israel out of Egypt; rather “The God who regathered his people Israel and brought them back to dwell in the land of their fathers.” That is where they are today in 2017. Moses, Jeremiah, Amos, Ezekiel and Isaiah along with other prophets had predicted the restoration of Israel after the dispersion caused by Israel’s disobedience. The year of the founding of this “it” spoken of by Jesus in Matthew 24 is traced through both the books of Daniel and Revelation in Misquoting Logic. As Antiochus Epiphanes, Selucid King of Syria placed an altar atop the Jewish Temple altar and sacrificed a pig thereon, the abomination of desolation also intercedes to disallow furtherance of Jewish worship. Upon it are the boastful words and abominable things prophesied by Jesus and Paul and again the book of Daniel is shown as authentic prophecy especially when it is confirmed by the words (also prophetic) in Revelation. This evidence is given as mercy to skeptics who are entreated to the math of the Bible timelines rendering their objections moot, at the astronomical statistical impossibility (unless God is speaking through them) of two men in history one from 500 years in advance of Jesus and the other writing 90 years after his birth, both triangulating and zeroing in on the same point in actual history with specific detail in regard to that event. The evidenced story here is a faith builder for those believing the Bible and absolute evidence destroying skepticism in it tracks. Those skeptics have doubted Daniel wrote his book before Alexander attacked the Persian Empire in 334 B.C. at the River Granicus due to the pinpoint accuracy of Daniel’s predictions. The book of Daniel was among the Dead Sea Scrolls hidden near the Dead Sea in Jars in about 200 B.C. So those who hid the scrolls containing all the books of the present day Old Testament the Jewish Bible of that time, except the book of Esther, believed Daniel to have been authentically prophetic by that date. Is it coincidence that these scrolls, proving the modern Old Testament is 95% accurate, were discovered in 1947, the year before the prophesied rebirth of Israel? The critics for decades upon decades had laughed Daniel off because there was no King Belshazzar as stated in Daniel, listed as king in the chronicles of Babylon. But a clay tablet was discovered which indeed speaks of Belshazzar, son of the last recorded king in the chronicles of Babylon, Nabonidus, silencing the critics. 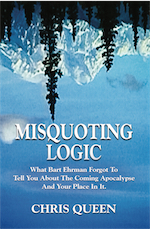 My Book: “Misquoting Logic: What Bart Ehrman Forgot To Tell You About The Coming Apocalypse And Your Place In It” provides hard objective evidence from authenticated history that the scriptures accurately tell the end from the beginning as the Lord God himself boasts through prophets. The evidence would stand in a court of law.